So do top CEOs and entrepreneurs. Military leaders use it. So do wedding planners. So do business executives of all kinds. Just about any time you have a complex scenario with a wide range of outcomes – which is certainly the case with investing – this technique has value. You can use it to improve your investing success and make better life decisions in general. The bigger the decision or the higher the stakes, the more crucial it becomes. "Postmortem" literally means "after death." In the medical field, a postmortem is an examination into how a patient died and why. The goal of a postmortem is to learn what happened and why it happened – and hopefully, to achieve better results next time. As the old joke goes, everybody benefits from a postmortem except the patient. In business or investing settings, you can do a postmortem to examine what went wrong with a project or investment after it has failed. The goal is the same: to learn what caused the failure and, hopefully, do better next time. A premortem is like a postmortem, but with one big difference: The premortem takes place before the investment (or project) has failed. Ideally, it takes place before the investment or project even starts. With a premortem, you imagine that "the patient has died" – that an investment idea crashed and burned or that a project has failed miserably. That's the first step... before you do anything else. After picturing this worst-case-scenario outcome, you then ask the question: "How did the failure happen?" From that point, you work backwards from different potential failures and create a list of causes for what went wrong. And then – because the negative outcome hasn't actually happened yet – you use this list of "what went wrong" items to failure-proof your project or your investment, increasing the odds that it will succeed. The premortem was popularized as a planning technique by Dr. Gary A. Klein, a specialist in decision making and cognitive task analysis. He got the idea from a 1989 study, conducted by researchers at Cornell, the University of Colorado, and the Wharton School. The 1989 study showed that "prospective hindsight" – picturing a future scenario and imagining it already occurred – increased the accuracy of pinpointing reasons for future outcomes by 30%. The subjects had a specific outcome to work with... instead of a vague mass of possibilities. So they came up with longer explanations for what happened, with more concrete, specific causes. The reason the premortem works is because it forces the brain to exercise its creative muscles and break out of normal channels. With normal prediction habits, where someone is asked what he or she expects to happen around a given investment, it is easy to stumble into psychological pitfalls... like overconfidence, confirmation bias, and more. The premortem technique takes the brain to a new place. If you genuinely try to imagine failure has already occurred, and then try to work out why, your subconscious will organize its agenda in a different way. This can help you generate new insights, see risks and problems more clearly, or identify factors that you would otherwise miss. To think about what might go wrong with an investment in advance. To think about what steps you will take, planned out ahead of time, if the worst happens. If Investment X hits the TradeStops trailing-stop alert, I will automatically sell my shares (or my broker will). Making a predefined list of rules makes use of the premortem in another interesting way... It anticipates "what could go wrong" with an investor's own emotional state. The worst time to prepare for a crisis is smack-dab in the middle of one. When the crisis is occurring, emotions are high and distractions abound, making it hard to think clearly. If you decide what to do in advance, you can take action calmly when the time comes – without having to make new decisions under stress. That's why creating a set of risk-management rules increases the odds that you will follow your plan when disaster strikes. This, in turn, helps you preserve your capital and increases your chances of success. That's why I created my TradeStops software... It offers a simple set of tools to help investors plan their trades – and manage their emotions. It may sound pessimistic, or even gloomy, to focus on failure before you even begin. But working through the risks beforehand and making a plan to deal with them is not pessimistic at all. It's a practical solution that will boost your odds of success. So make sure you're using it to plan your investments today. Editor's note: Making investment decisions based on emotion can wreck your overall performance... And it's a big danger right now, after the volatility in recent months. If you're at a loss for how to plan ahead for today's market, tune in to his special event on Wednesday, February 13, at 8 p.m. Eastern time. Richard will join some of the world's most famous "bulls" and "bears" to discuss what you should do with your stocks in 2019. Sign up for the free event right here. "As investors, we are risk-seeking when it comes to our losses, but we are risk-averse when it comes to our gains," Richard writes. Read more about what he means – and what you can do about it – here: A Critical Chart for Every Investor to See. "The markets are full of variables – too many for the brain to grasp," Richard says. "But that's only part of it." Learn about the deeper problem that many investors face – including some of the smartest in the world – right here. Chipotle Mexican Grill (CMG) is famous for healthy, quick-serve food with high-quality ingredients. That’s why the $15 billion restaurant chain sold off when it suffered food-safety scares in 2015 and 2017 – investors feared a devastating blow to the company’s image. 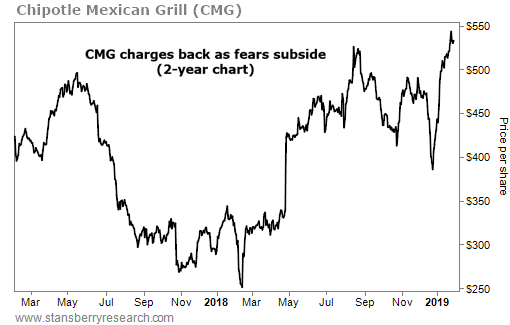 But last February, Chipotle brought on Brian Niccol as CEO… And his efforts to reassure customers and boost online sales paid off with a 50% bump in digital revenue in the latest quarter. Total sales also increased 9% year over year to $1.2 billion.